Gov. Roy Cooper sent a letter today to Senate President Pro Tem Phil Berger urging him to reconsider the confirmation hearings schedule in light of pending litigation. 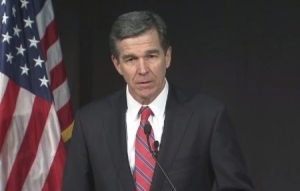 Cooper sued the General Assembly over House Bill 17, which strips him of a number of powers and appointments and institutes Senate confirmation hearings for the governor’s appointments. The lawsuit is pending, but hearings are set to take place beginning Wednesday with former Rep. Larry Hall, who was appointed to become secretary of the state Department of Veterans and Military Affairs. In the letter Cooper wrote to Berger, he stresses his desire to come to an amicable consensus over scheduling hearings to avoid legal confrontation, according to a release from his office. He also points out that high priority items, such as repealing House Bill 2 and raising teacher pay, could be displaced and delayed if an extended confirmation process were to take place. The Cabinet secretaries I have appointed look forward to a close working relationship with you and the members of the Legislature. They have been visiting your members and we look forward to them appearing before other committees, visiting your caucuses, providing information and answering questions and communicating in other ways with you. House Bill 17 (N.C.G.S. Section 143 B-9) passed in December after my election directs me, as Governor, to submit the names of cabinet secretaries for senatorial advice and consent. This law is unprecedented as far as we know and has been challenged as unconstitutional in a lawsuit filed in Wake County. Despite the pending lawsuit and despite my request for delay until the lawsuit is decided, the Senate has scheduled my appointees to appear for confirmation hearings beginning this Wednesday, February 8th. These hearings are premature for two reasons. First, the lawsuit provides clear case law from the Supreme Court that advice and consent applies only to Constitutional officers and not statutory cabinet secretaries. Second, North Carolina law says I am not required to submit names of persons to be confirmed to the President of the Senate until May 15, 2017 (see N.C.G.S Section 147-12(3d) and I have not done so. I would prefer to work this scheduling issue out amicably rather than resorting to the courts. To that end, I asked my legal team to try to expedite the court proceedings so that a final decision on the merits of our claims could be achieved in time for me to meet the May 15th deadline, if necessary. Consistent with that, I understand that my lawyers and those representing you and Speaker Moore have proposed to the court a schedule which would provide for a hearing and decision by the panel in early March of this year. The opportunity still exists to avoid needless confrontation and court proceedings over a scheduling issue. But with hearings set to begin on Wednesday, that window is rapidly closing. Instead of going through all of these confirmation hearings which we believe will become moot, why don’t we instead concentrate on continuing the excellent work your leadership and I are already doing on job recruitment? We also must find a solution on HB 2 and have more detailed discussions about teacher pay and Medicaid, among many other issues. Our time and energy would be better spent on these challenges. I know we disagree on the constitutionality of this law, but I hope we can resolve this issue concerning the delay of hearings in a manner that reflects a spirit of respect for the offices we both hold and the people of the state we both serve. It’s nice to have a grownup in the governor’s mansion again…..just to bad we can’t say the same about the leadership in the state House and Senate.